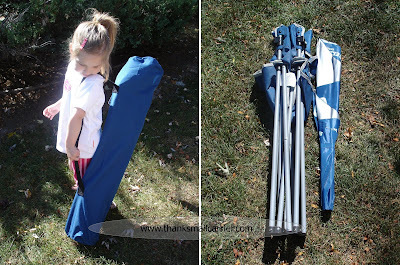 During my recent Sport-Brella giveaway, did I manage to mention how great it is to have one? It is so light, portable, quick and easy to use and just plain convenient to be able to have such an expanse of shade whenever and wherever you need it. However, maybe there are times that you don't need eight entire feet of beach umbrella, sun tent and weather shelter... maybe you just want a comfortable, relaxing spot in the shade to watch your next sporting event, parade or birds in the backyard. Well, in that case, the ultimate seat-that-feels-like-a-throne is the individual-size member of the Sport-Brella family, the Sport-Brella Chair. The only umbrella chair that has its own full 360° of coverage, the Sport-Brella Chair allows you to face your seat in any position but still stay cool and protected from the sun and wind. No more squinting, sweating and sunburn, this chair does all of the work to keep you safe with its simple and convenient Sport-Brella attachment. Right out of the box, this chair was light and easy to carry in its durable bag with the provided strap. Once we had reached our destination (a place for Mommy to sit and relax while the girls played outside) set-up for this chair took less than a minute. An instant seat, the nylon and canvas sport chair itself popped right open on its steel frame and was ready to go. Then, connecting the ultra-aerodynamic umbrella was only a matter of sliding the hinge on the end into one of two of the connectors (one on each side) of the chair itself and opening it up. Adjusting the umbrella was basically fool-proof, as there are two push-button hinges that allow you to swivel it backwards, forwards and tilt it to pretty much any angle. Whether the wind was blowing or the sun was shining down, I had no problem making sure that the chair had as much shade as I wanted due to the umbrella's 46" length. With a UPF 50+ lining in the umbrella and a weight limit of 280 pounds, the Sport-Brella Chair is a relaxing, comfortable place for just about anyone to take a load off their feet and enjoy watching the game or the sights. 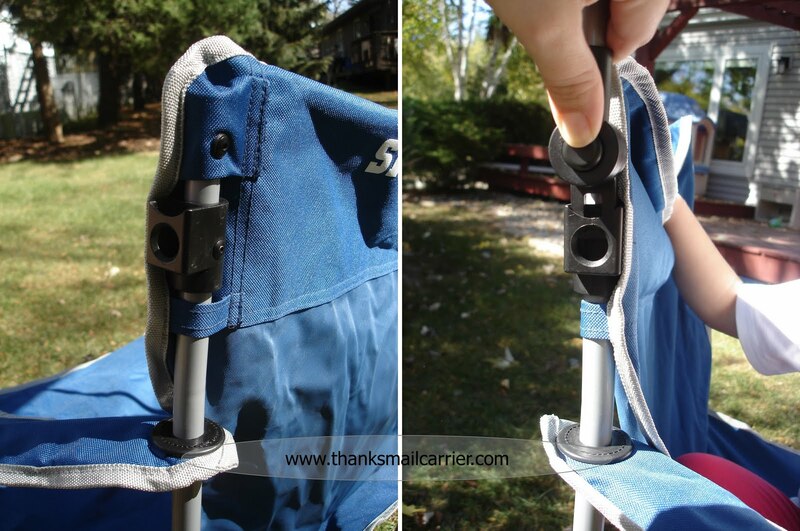 There is not only a handy cup holder but a zippered pocket right in the front to hold your keys or other small items. As it has a bottle opener zipper pull, you might just never have to get up once you're sitting in style in your Sport-Brella Chair. 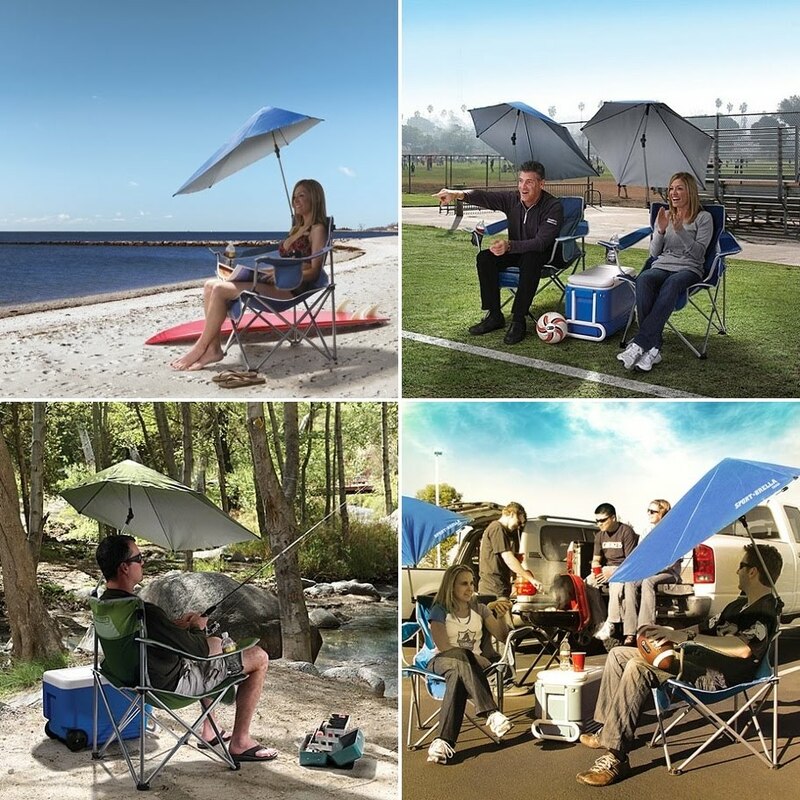 Whether you are heading out to tailgate, fish, camp, read a book or watch the waves at the beach, the Sport-Brella Chair folds compactly, sets up almost immediately and keeps you or your family shaded and happy. Why sit outside without it? 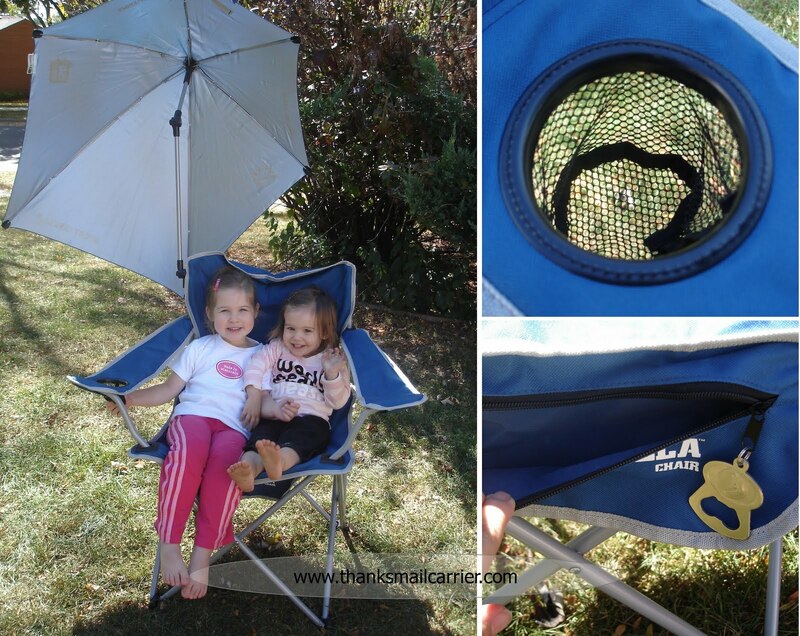 One lucky person will win a Sport-Brella Chair of their own! ARV $39.99! To enter to win: Visit Sport-Brella and tell me why you would like to win this innovative chair. 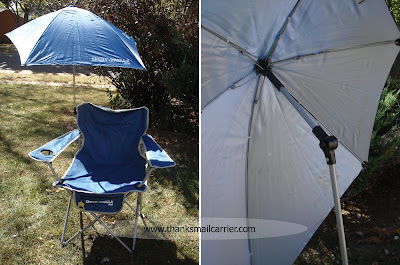 3 Extra Entries if you blog about this giveaway linking back to Thanks, Mail Carrier and Sport-Brella. A big thank you to SKLZ for providing a Sport-Brella Chair for review as well as for one lucky giveaway winner. The opinions shared are my own and honest and if you really need to see more, click here to see how I roll. This would be a great chair for when my mom sits outside. I'd love to win this chair because it'd be perfect to sit in and watch my son's soccer games. This looks like the perfect solution to days when I go to the beach and watch my husband surf! Sometimes I don't feel like doing the whole towel in the sand thing and this would be great sun cover as well! I like Sportbrella on Facebook as Katy Morris. My kids play outdoors a lot...whether it just be in the sandbox, or at football games! This is a great chair to have! I would like to win this chair because it would be perfect for any of my family members when we go fishing, which is a lot! I'd like to win this because so often when I go somewhere it is hard to find shade! i would love to win this because i am in south florida and it gets super hot during my daughters tball games. 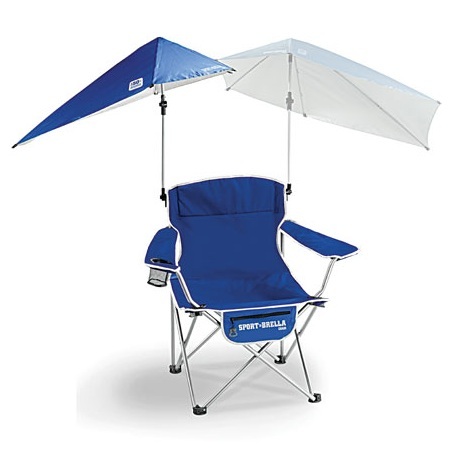 We do a lot of RVing with groups and this item would be great to use as we sit outside. We always seem to be short on shade! Visit and Follow From To The Top Tuesday. This would be a great chair when sitting outside with my baby! Instant shade would be so nice! I've always had to be so cautious in the sun with skin cancer running in the family. I would love to have this for soccer games and camping! I would love to win this chair because I have a hard time being outside in the sun, which makes it hard to take my daughter outside - this would be the perfect fix for that as we have no shade in our yard! I like Sport-Brella on FB - Cari S.
I commented on their wall - Cari S.
We take at least two beach vacations a year so this would be a great chair to use. Thanks for the chance! I entered your Miraclebody giveaway today. I'd love to win it for when we go to the dog park and my husbands legs start aching for being on his feet too many hours in a day. His work basically has him on his feet, so sometimes he just needs to sit and rest after his thirteen hour shifts. I Liked Sport-Brella on Facebook. I also copied and pasted the information you provided on their Facebook page. 1. I now follow via GFC. 2. I now follow via Google Friends Connect. I subscribed via email and will confirm my subscription later today. 2. I subscribed via email to Thanks, Mail Carrier and will confirm my subscription later today. So hard to protect yourself from the CA sun and this chair would be perfect for that! I would like to win this to give to my daughter when she sees my granddaughter game. Or when I go watch her play outside. This would be great to bring to my son's soccer games. Would be great to win because I love spending time outdoors in the summer but have pale skin that burns easily! I would love to win this because my son plays select baseball so we are always on the go and in the hot sun watching the games. This would be perfect! I have a Horse tack Store and Set up at local 4-H Events for the kids. This would be perfect for our down time when the kids are riding!!! MANDATORY ENTRY: I really, really, really, really, really, really, want to WIN this giveaway so I can use it at my daughter's soccer game. Every Saturday I BAKE out in the bright morning sun and leave sunburnt, EVERY Saturday!!!!! If I won this giveaway, I just know that I could possibly NOT get burnt!!!!! I really need this chair, PLEASE!!!!!!!! We could use this for our family picnics and for tailgating.